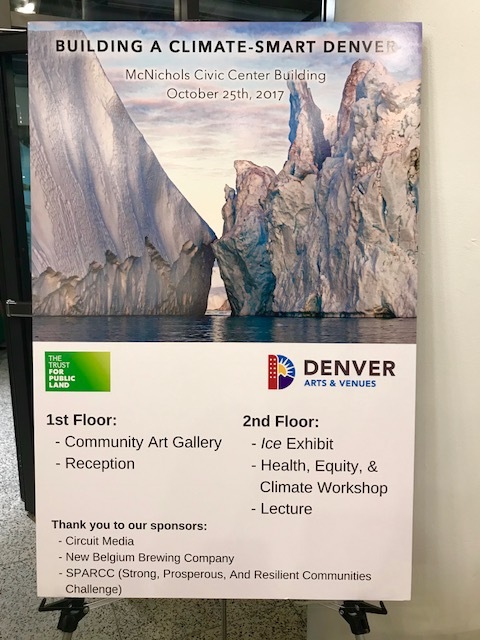 As part of our continued commitment to our Certified Green Company status, Circuit Media was proud to sponsor the inaugural Building a Climate-Smart Denver at the McNichols Civic Center Building October 25, 2017. The summit brings together hundreds of local businesses, civic leaders and nonprofit organizations that continue to combat climate change. In addition, The Trust for Public Land hosts a roundtable that focused on health and climate change in Denver. Award-winning photographer James Balog discussed the effects of global climate change. Balong emphasized how local communities can become more resilient to illustrate climate-smart in developing green solutions. Balog’s “Chasing Ice” photography exhibit will be on display through the end of the year. Proceeds from the reception supported The Trust for Public Land’s Climate-Smart Cities program.